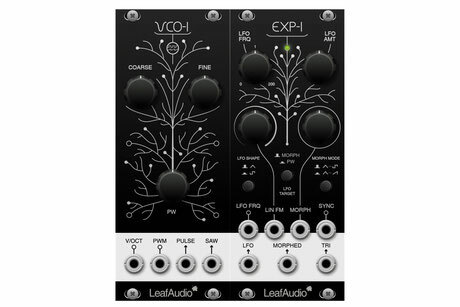 / EXP-1 - leaf-audios Webseite! 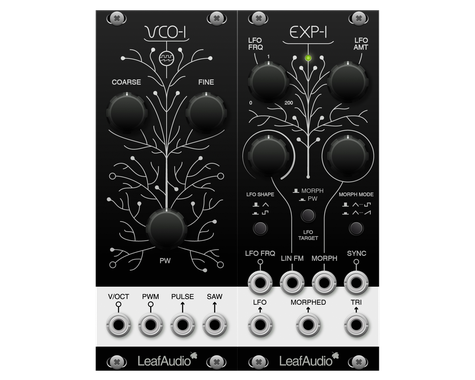 EXP-1 is an expander module for our analogue Eurorack oscillator VCO-1. It adds an LFO with two waveforms (square, triangle) and various modulation targets, sync, lin. FM, wave morphing, an additional triangle output etc. Together with VCO-1 it is a complex oscillator with lots of internal or external modulation possibilities. The size of 10HP for each module and long knobs with a good grip makes it a perfect working horse for your system and all controls are super precise. The bi-polar LFO LED (green/red) shows you the exact frequency and polarity. The left 50% of the frequency knob cover 0 to 1Hz, the second 50% cover 1Hz to 200Hz, so you can adjust the low frequencies very precise. DIY level: Medium. The EXP-1 DIY kit can be built by medium experienced DIYers in about 2-4h. Building Instructions can be downloaded here. Availability: Besides our workshops, EXP-1 is available in our online shop Exploding Shed. Powersupply: Like all Eurorack modules, the EXP-1 is powered by a symmetrical power of +/-12V. Additionally it is linked to VCO-1 via ribbon cable, they act as one module then.